Do you fancy sun, beach and sea? Then book a hireal car for Formentera today and explore the island paradise near Mallorca and Ibiza on your own. With a hireal car on Formentera you are always flexible and independent of public transport. 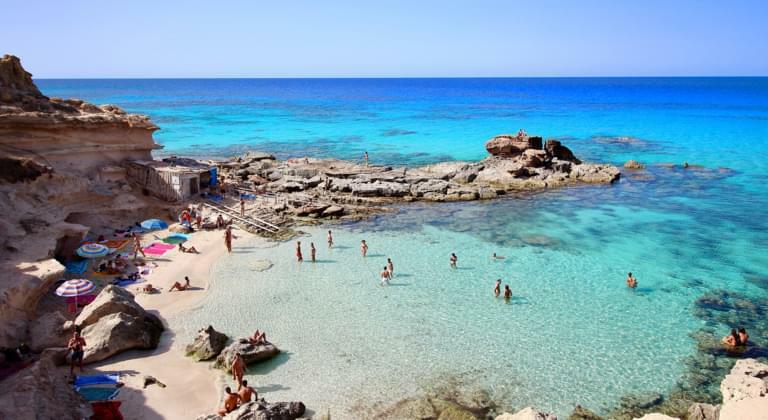 Drive your dream car to the most beautiful beaches and most exciting sights on Formentera. You can find the right vehicle for your trip on Driveboo.com. Our portal compares car hire prices and shows you the best price. What are you waiting for? Compare prices and book a hireal car for Formentera! Where can I get my hireal car on Formentera? If you book your desired car online in advance, you only have to pick it up at one of the car hire companies on Formentera. These are located either in La Savina or in Sant Francesc de Formentera. In any case, take out fully comprehensive insurance without excess. In this way, even in the event of damage, you will not incur any additional costs and you can enjoy Formentera completely stress-free. Features: air conditioning, all-wheel drive, automatic, etc. For example, drive to the church of Sant Francesc Xavier for a visit by hireal car. The architecture is sure to delight you. Afterwards you can stroll through the town.